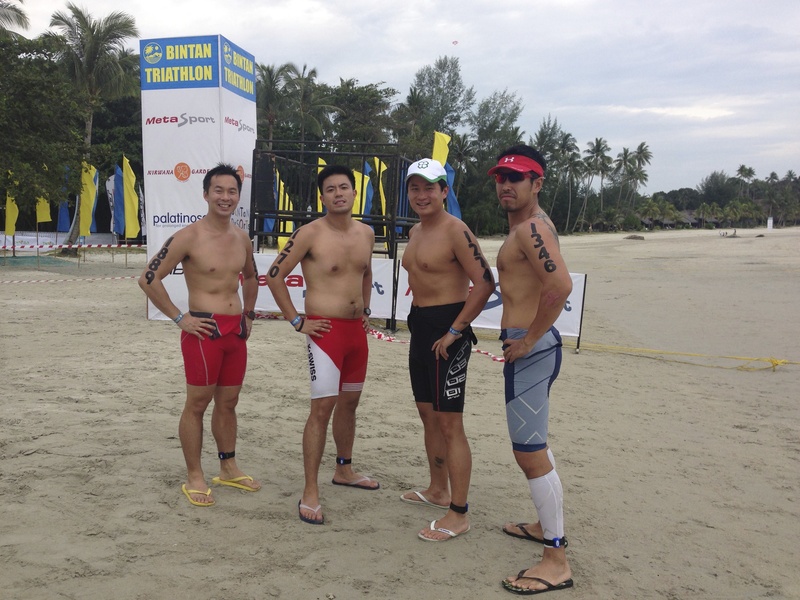 Bintan is an unusual race in that it starts in the afternoon at 1:45PM. This was the first race i’ve done which doesn’t have a early morning start so the early dinner preparations and bathroom strategy was not as important. That said, we were all slightly confused as to what and how much to eat for breakfast/ lunch for the day of the race. I ended up eating half of a leftover sandwich and a couple of bananas for a late breakfast/ brunch. Weather conditions for the race were near perfect. We had an overcast day which blocked most of the sun but it was still warm enough to dry up the rain that had fallen earlier in the morning. So we headed to the transition area at around 10:30AM to set up. Transition area was quite spacious – in total there were supposed to be 600 competitors but apparently only around 500 competitors turned up for the race which is always comforting to know with the mass swim start. During the transition we practiced the the T1 exit. 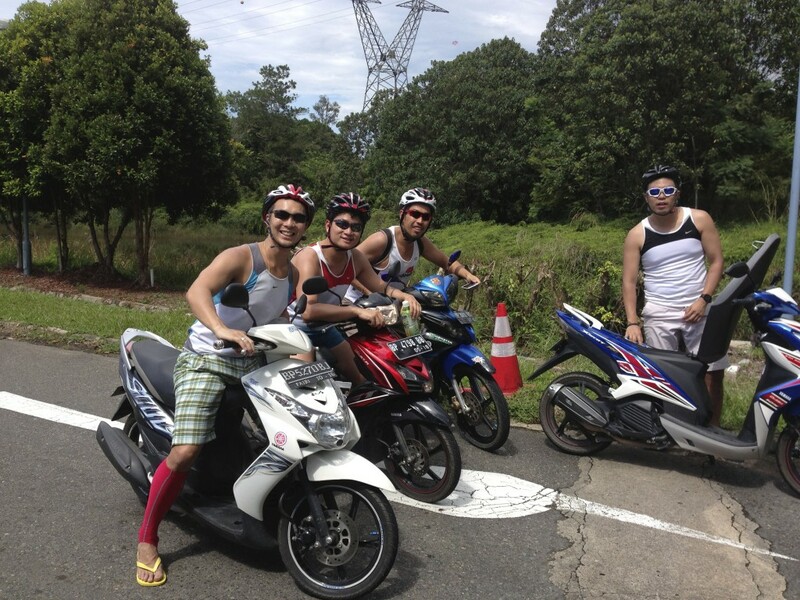 After picking up the bicycle from T1, competitors face a steep uphill climb of around 100 meters to get out of the resort area. In fact, you mount on a slight incline so you have to make sure that your bike is already in a low gear. Speaking to past participants we heard that spectators often gathered at the exit of T1 because cyclists often fell over in this area when struggling up the hill – especially if they were not in the right gear! So practicing this segment was a priority on race day to avoid embarrassment! In my past triathlons I had always started on the outside at the back of the swim. The swim start of a triathlon is a melee of arms and legs thrashing in the water. It’s the only part of the triathlon I always get nervous at and so before i’d always start at the back to try and get my own space. This time with the increasing “friendly” rivalry with my friends Tevis and Casey and newcomer to our trigroup Dave I decided I would try starting midpack to get more of a head start. The strategy paid off as I emerged first out of the group (although I did not know it at the time) but this definitely resulted in a tougher swim. Instead of having a clear lane when starting out at the back I was fighting my way with and through swimmers all around me for at the first 3/4 of the 1.5KM swim. Several times I swallowed sea water but fortunately my goggles did not come off. Later I learnt an important swim draft fact – that the best place to draft is off the the side of a swimmer by their waist – NOT right behind them as I had been doing and getting kicked in the face! ‘doh! Casey’s water bottle springs a leak! Coming out of the swim I knew I was in the top 1/3 from looking back out on the people still out on the swim course – this boosted my confidence and a friend standing by the T1 entrance, Eng Kim , told me I had a sub 30min swim time confirmed this. So running through T1 I quickly slipped on my shoes (no socks), helmet, glasses and wheeled my bike onto the course. I quickly settled into the bike and aimed to keep my avg. speed around 32-33KM/H. 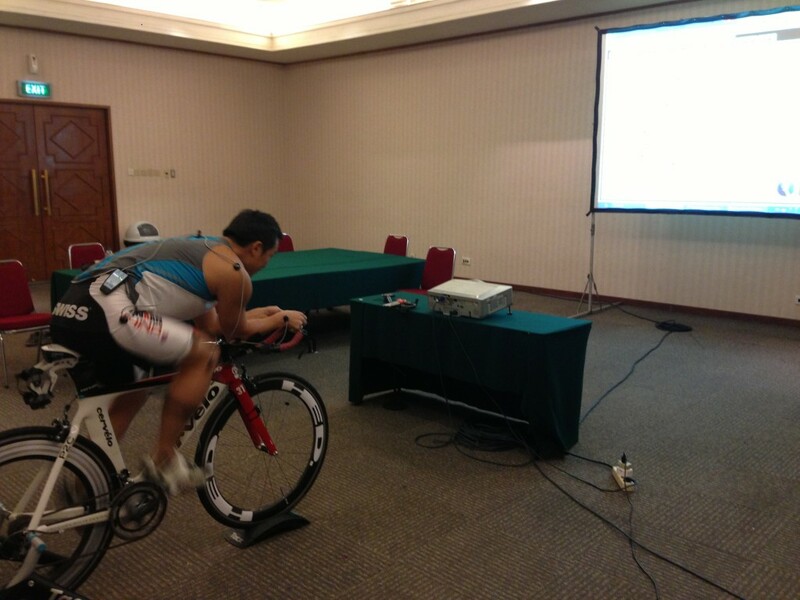 Since my bike refitting I was a lot more comfortable in aero position and this was perfect for the rolling course. I didn’t see any of my competition during the entire cycle and was beginning to think may be I had the lead. But turning my focus on my own race and knowing that hydration was key to a being able to maintain my pace during the run; I ensured I kept drinking during the bike every 10 minutes. In all I estimated an intake of around 2.5 litres of Accelerade during the bike. The run course follows a path around the resort with short hill climbs, forest runs and beachside paths. There were a number of turn arounds that let’s you see the pack of competitors up to 100m behind you. In all it is a two lap course ending at the transition area so plenty of spectators to cheer you on. My legs felt okay coming out of the bike and I immediately went into a 12KM/H pace for the run. However watching my HR creep to 180 (it had been around 175 for the bike) I wondered if I could keep it up. At the same time checking my watch I saw total elapsed time of 1hr 41′ out of T2 and although I fancied a shot at a sub 2:30 time; I was already on course for a PB (previous PB was 2:48) by a wide margin which I would be happy with. Then my inspiration came – during the first turnaround I saw Tevis coming up behind me looking strong. He’d clearly done a lot of work on his running with his “Macca sets” and was less than 10 seconds behind. I resolved to run faster and tried to increase the distance between us. Each lap there were 2 turn arounds and each one I estimated that I had may be gained a second or so. As we came out of the second turnaround on the second lap and with 2KM left I felt that I probably had him as I could no longer see him. I was wrong. in the last kilometer I decided I would do a quick check and there I saw him – he’d massively increased his pace and had strategically saved up to sprint the last 400m! By then it was too late at around 200m to go he flew past me to finish just 5 secs ahead. Tevis with his 5 sec lead! Super fun race, beautiful course, well organized (great marshalls!) will be back again next year! All in all it was a great race – made even better when we found out later in the race results that Tevis had received a 2 min. draft penalty bringing me back on top! Both Casey and Dave finished sub 3 which was remarkable given it was Dave’s first ever triathlon. 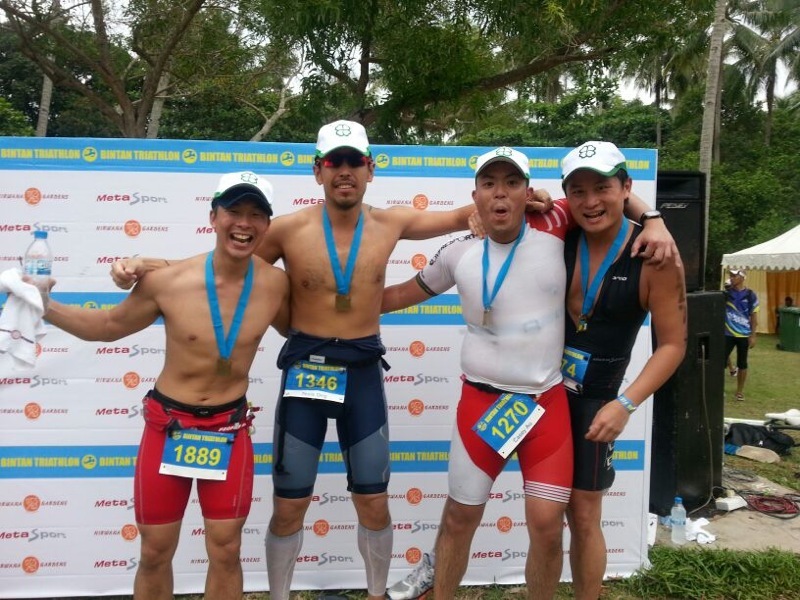 Casey – clearly resting on the laurels of his Phuket victory has work to do for Cebu! (or significant upgrades to his bike!). 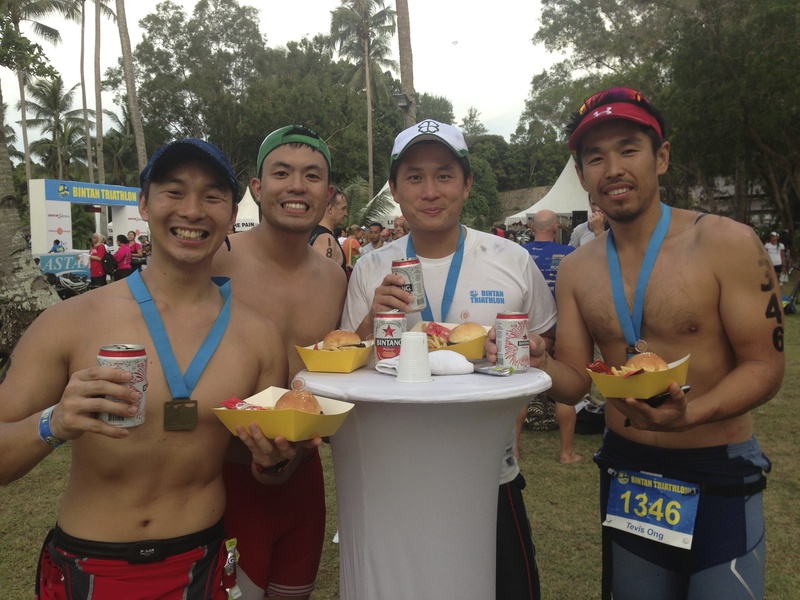 The best post race nutrition – beer n burgerts! 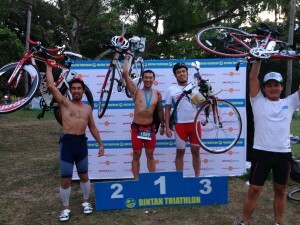 Bintan triathlon an international triathlon run by Metaman on the island of Bintan, Indonesia. The island is an hour’s ferry ride from Singapore and set in the Niwana resort. Overall it is a very well organized triathlon now in its 9th year running (as of 2013) and draws a good list of age groupers. There were approximately 600 age groupers in the Olympic distance. The course starts with a beach start for a sea swim in calm waters, a long single loop rolling hills course and a double loop resort run. The course itself presents a good PB destination however this can be weather dependent. Men’s position leaders come in around the 2+ hour mark and with some training age groupers can hit a sub 3 hour OD on this course. The race starts in the afternoon as the organizers say that this presents cooler weather than a morning start. When the sun is out temperatures can soar into high 30 deg. C and humidity can make for a tough race as well. The race is set in the resort complex of Niwana which makes for the logical place to stay. However this comes at a price with rooms easily being more than SG$300/ night. Rooms are also booked out very early due to the level of interest in this event. We chose to stay at Bintan lodge which was significantly cheaper and still close enough to the resort complex (about 8km) however the rooms are very very basic. In terms of food – resort food comes at resort prices with “special menus” only available during the event. Staying at Bintan lodge we walked down to the hawker center where we could get nasi goreng/ soto ayam for about $1/ dish. There was also a reasonable Chinese restaurant near the hawker center. Nearby convenience stores have very limited supplies and would recommend that athletes bring their own breakfasts and snacks. In preparation for the race we arrived the morning before in order to check the bike course. 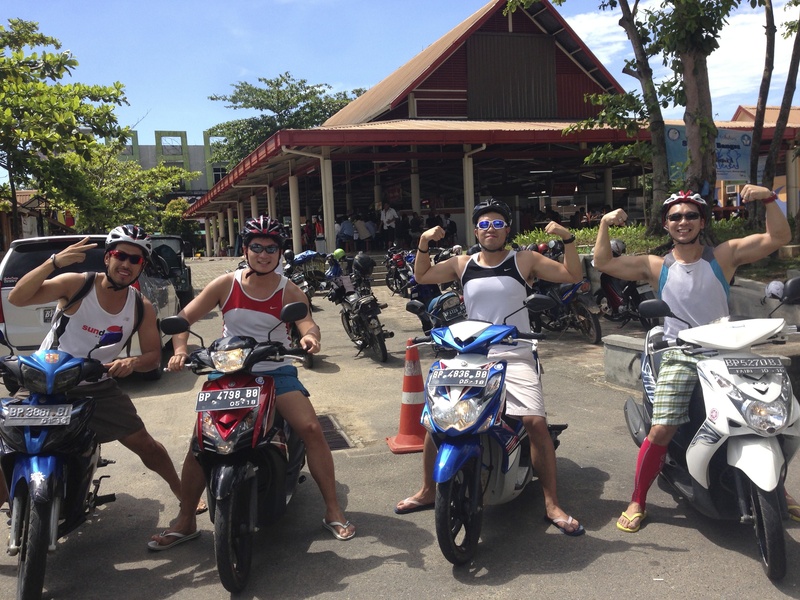 Taking advice from a blog we rented motorbikes to ride around the bike course. This was especially beneficial to give an idea of the latter part of the course which had a series of short climbs and downhills. As well as some preparation for the various speed bumps and sharp turns that were on the course. Arriving the day before was also helpful in getting to the bike mechanic early and avoiding any last minute glitches with our bikes. This was the first race that I had done that had an planned afternoon start. Hence the usual early dinners were not as important. However we did start hydrating from late afternoon. Even whizzing around on the motorbikes had left us parched and dehydrated and with the afternoon sun some major tan lines as well. All we could do was to hope that the weather the next day would be more conducive to the race! 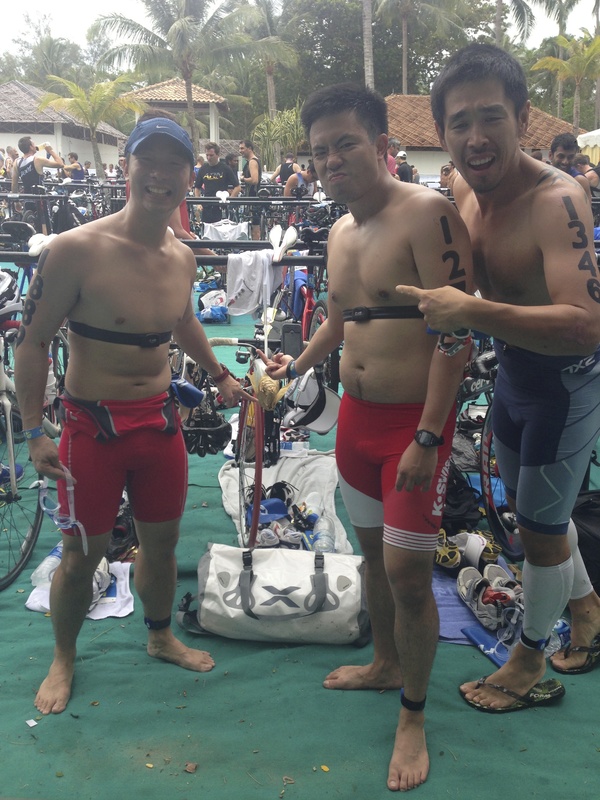 Bintan Race Report Part I: The signs are NOT to race…. If there were such things as signs for me to not participate in the Bintan International olympic distance race then I certainly received a lot of them. It started just 6 days before the race when after my Sunday morning training session I felt my left ear seemed “blocked” as if there was some water stuck inside. I decided that it would probably go away by the next day. However when it persisted I thought it would be wise to see the doctor. Upon examination the doctor said you have a throat infection which has spread to your inner ear causing inflammation and therefore partial deafness. 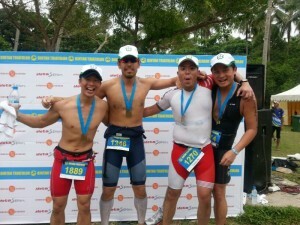 I was stunned, just 5 days before my race! However I reflected on the previous week’s training where i had done a 5 hour brick session far over what was on my plan and feeling incredibly tired as a result. I had probably caught something during my weakened post training state. So the doctor prescribed 7 days of antibiotics but said that if my ear returned to normal by Friday then I would be able to participate. The week rushed by and my ear improved. Yes, i was back on track! So Thursday evening i packed my bags and was all ready to go first thing 5AM Friday morning. I was flying Mandala Airlines (but on a Tiger codeshare) but my ticket did not indicate which terminal so we headed to terminal 1 because Mandala flights typically leave from there. Wrong! That was domestic. So off we went to terminal 2. Wrong again! Terminal 3! Arriving finally at the correct terminal i rushed inside with less than an hour to take off. Bags checked in i was at least on the flight – at least that’s what i thought… Coming up the escalator i was confronted with a mile long queue for immigration with just 10 minutes to boarding I’ll never make it I thought – so i walked up to the front and asked the immigration officer if i could skip. He looked surprised and told me to go to the back. Fortunately, an Air Asia flight had a group of travelers who had yet to board as well and they called for all passengers to come up and cut through. I followed the crowd and again fluked an entry. However my last and final sign was upon race registration. Looking through the list I couldn’t find my name in the race list so i thought there must be some mistake. So i looked through my emails but yet failed to find any race registration! I suddenly thought could it be possible that I had convinced my group of 3 other friends to all sign up for the race and yet forget to register myself?! I could think of only one option – plead to the race directors! Fortunately they had some spare entries and allowed me to do an on spot entry. As I prepare for the Bintan Olympic triathlon next week my training this Sunday changed to introduce a double brick versus the usual long bike and run. This was an interesting mix and helped me focus on the transition from bike to run. Unfortunately continued rain from the night before changed my outdoor cycle plans to an indoor turbo session. However there i discovered the pleasure of watching videos on the official IM youtube channel while on my turbo. Overall it was a good session with reasonable energy levels. Easier than my last week 5 hour long session but probably more helpful to prepare for the Olympic next week! First century ride, a good dose of endorphines and confidence booster! So after a 3 hour 35 min bike which my GPS counted as 106KM and my Polar 97KM (so I counted a century) I headed to the gym for my 30 minute z2 run. However after 30 mins I felt so good I decided to go on – and as I hit the 4 hour 30 min. mark I experienced a massive endorphine rush. I couldn’t help smiling ear to ear and had a sense that I could just keep going. Fortunately my Ironman playlist ended after 1.5 hrs running providing me with a perfect excuse to stop. They say train like a horse (don’t question the plan!) but today it just felt right. I’ll be going into my usual Monday rest + fast so hope that will help my body recover fully for the next week’s of training. 2 weeks now till Bintan! Last week had the opportunity to do a Retul Fitting for my bicycles. I was originally fitted on my P2C when I bought it at the Bike Boutique 5 years ago however after multiple disassemblies and changing of parts the original measurements and settings have long been lost. Given both a planned century ride on my R3 and the Ironman at the end of the year I thought it would be wise to invest into a proper fitting. What is a Retul Fitting? What were the results and was it worth it? Aside from the cool gadgetry, professional fitters bring experience and qualifications that can at a minimum help you with a more comfortable and efficient ride. However a bad fitting bike can also be a source for injury ending months of training in disappointment so in my opinion it is important that you are fitted properly if you regularly train on a bicycle. However side from the adjustments to fitting the monitoring tools also provide an interesting insight into the efficiency of your cycling. For example I discovered that I have a tendency to lift my heels which puts undue strain on the calf muscles. This could be caused by a previously ill fitting bike (for example with a seat post too high). An additional monitor also shows a horizontal trace of your knee movement. lateral movement of the knee is also inefficient and was some tangible evidence that I need to work on improving my pedal stroke mechanics. Given my plans for a full Ironman at the end of the year and that I’ll be spending anywhere from 5-10 hours on my bike each week. I think that the fitting was worth it. I fit both my bikes for about US$450 and a single bike fit would have cost US$300. Also once you have done the fitting you have a comprehensive report with every measurement on the bike that you need to ensure a proper fitting every time you assemble the bike. 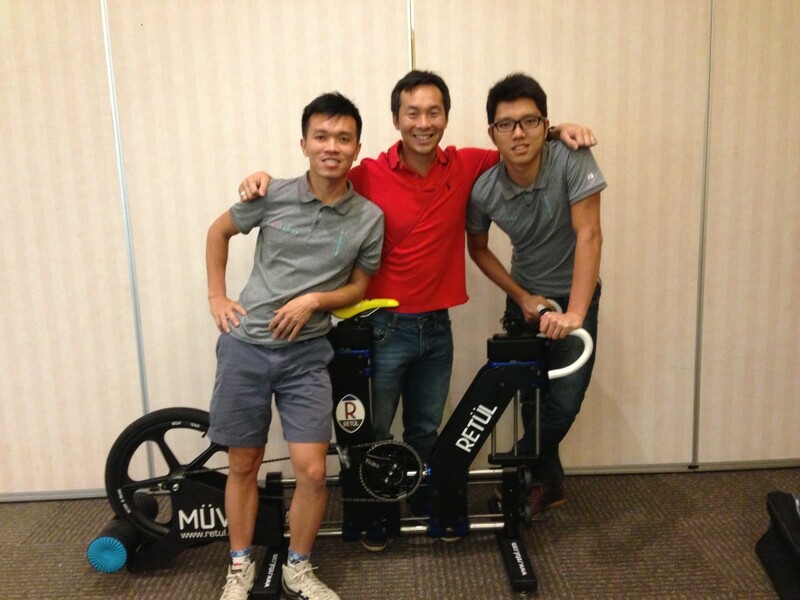 With Choon Wei & Tim Professional Retul fitters! Below is an except from my fitting notes! Changes during fit: Neutral cleat position. (1) Saddle moved down 8mm. (2) Saddle moved forward 1mm. (3) Handlebars moved down 7mm. (3) Armrest pad from up to level. 1) Change to straight seatpost and move setback forward by 5mm. 1) Change aerobar extension to allow arms to rest properly on armrest pad, and have a ski bend extension for more natural wrist position. 2) Swap crankset between R3 and P2, 165mm on P2 and 170mm on R3. Stretching that hamstring and hip flexors. Relax ankles and drop heels. This week I had an interval run training on the plan as well as a threshold bike. 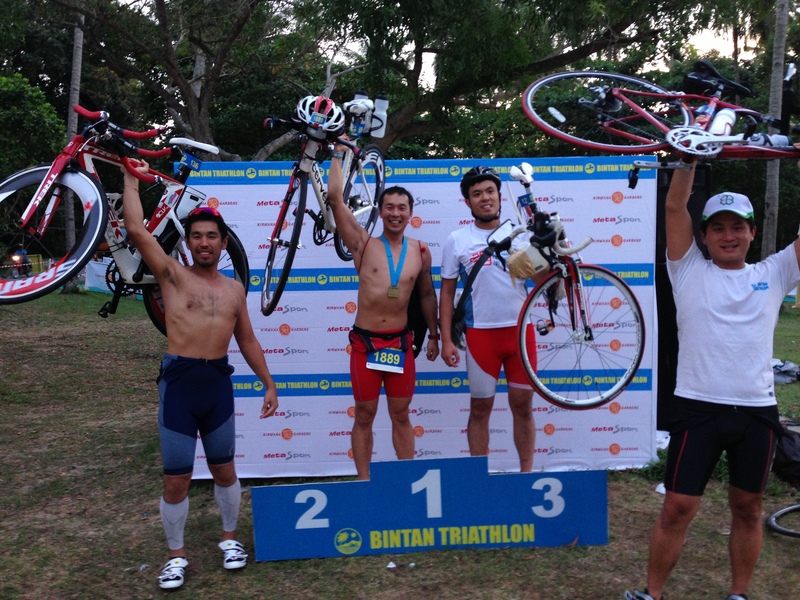 I’ve swapped in some higher intensity work outs in the run up to the Bintan Olympic distance triathlon on May 18th. With a goal to do a sub-3 hour time on the course I’ll need to focus both on increasing my Bike and Run segments. During the main set I averaged a low Zone three for the 4×4 mins and then a mid Zone 4 for the 4 x1 mins sets. It was a satisfying work out which I performed on a treadmill with a 1% incline. In total I completed about 8.8KM in distance over the work out. My friend also recommended “Macca sets” which I tried a while back but was not at a fitness level ready to complete. I’ll plan on doing the Macca Sets next week and report how it went. Somehow treadmill training – even with an ipad in front seems interminably more difficult than running outside. So after some lackluster treadmill sessions in the past few weeks I decided to take the time in the morning to go to a nearby stadium to run. So on the training plan today was doing a threshold run…. what is a threshold run? A threshold run is quite simply running at the top of your aerobic zone. This is also known as your lactate threshold which is the pace at which lactate begins to build hence causing you to slow down. These runs typically last from 20-40 minutes can are performed typically up to 80% of Max HR. They are helpful for improving your aerobic capacity and speed. Based on my age my Max HR is calculated as 186. This would mean that my threshold run was performed just over my target zone at 84% of Max HR. I’m still working on calculating my more accurate zone rates but based on PRE (Perceived Rate of Exertion) my estimate is the my aerobic threshold is at HR of 160. One of the technical books I am reading for Ironman preparation is “Going Long” by Joe Friel and Gordon Byrn. The book is suited for all levels of triathlete attempting the Ironman distance and is written in a very accessible style. You can find the book on Amazon here. The book approaches all the disciplines separately for technique and training and also covers nutrition, strategy and injury. Rule 4: Sleep is more valuable than training!! I find most fascinating the emphasis on recovery (Rule 1/4/6). The key to a successful first time finish is the consistency in training and focusing on those long core workouts which will help build your base endurance to complete the full Ironman. This makes sense because perhaps one of the largest risks to training is injury/ illness caused by high intensity/ over load of training. So bear in mind – while training is important you only reap the benefits of training when you are resting! 1) Reinforce and support my goal: once people know about my goal they often ask how things are going and about my training. This gives me support and frequent reminders to stay on course with training. 2) Inspiration: to many IM distance is something incredible (it still is to me). the mixture of both surprise and admiration in reactions inspires me and keeps me grounded on just how tough this event will be. 3) Understanding: when the majority of your free time goes into training people start to wonder where you’ve gone! Again by being public about my goal and the training that i’m putting in helps people understand that I haven’t suddenly become unsociable but rather 5AM starts for training simple don’t mix well with late dinners and bar hopping!